Ali Kirby and Christopher Mahon, ‘only connect’, installation view. Photograph by Gillian Buckley. Image courtesy of the artists and Kevin Kavanagh Gallery. Sculptures often prompt brief love affairs with surfaces. As contours catch half-light and cast shadows that evoke the baroque, a special kind of immediacy emerges from the tactile outlines of plaster and stone. From first contact, only connect is invested in directness. It is as if the title has been abruptly cut from a sentence and urgently repurposed to make an appeal for visceral sensation. Ali Kirby’s That Time is cadenced and repetitive. A plane of plaster is mounted to the wall, holding semi-circular overlapping patterns. The human body is implicit in this object’s past, its surface whispering a history of eyes precisely guiding swaying hands. Christopher Mahon’s Resting Face feels like a nod to monumentalism. Its faintly totemic marble structure is accented by the witty trickery of its cast wax shadow, giving the show a surprisingly slapstick slant. The smooth, cartoonish form resembles a hand-drawn squiggle standing on end. Such works present incongruous poles of content, harking back to formal materialism while prioritising humanness and the emotional tones of physical forms. Through such oppositions, only connect comes to signify a space of engagement that lies somewhere between criticality and the experience of being entertained. The surface effects are absorbing, as materials take on the status of bodies with skins and are encountered with a level of intimacy and nuance that traps initial reactions between fascination and analysis. 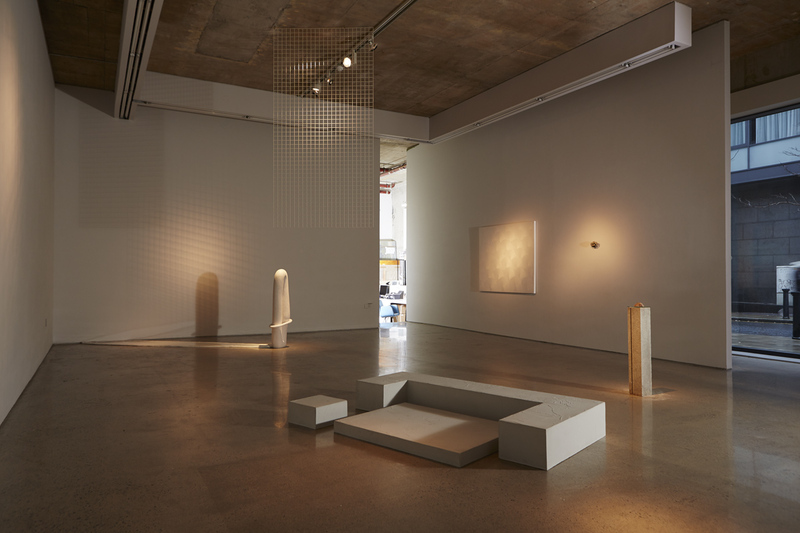 Coinciding with the postmodern turn in exhibition making towards the transdisciplinary and politicised, only connect produces a generous space to articulate the legacies of materialist sculpture. Its human, tender aesthetic offering a compensatory conversation to politics, Kirby and Mahon test the space of consciousness by buttressing this call for physicality with an aesthetic quality that hints at ethereal effects, the trans-physical and the semi-sacred. only connect is at once reflective and eccentric, willfully abstract but imbued with human perspective. Marie Farrington makes sculptures that trace the intersections between history, knowledge and making by exploring the subtle entropies contained within materials. Ali Kirby and Christopher Mahon, ‘only connect’ at Kevin Kavanagh Gallery, Dublin, 5 – 8 January 2017.